Happy Monday friends!! Starting the week after a wonderful weekend makes Monday's a little easier to tackle!! Here's a look at what we got up to... On Friday we celebrated Passover at my sister's house. A beautiful table set with great food made for a wonderful night. Nothing quite like Matzo soup! We were anticipating a pretty gloomy day on Saturday so we decided to use some tickets to the MFA. I'd say most people came to see Mega Cities Asia, but the Techstyle exhibit was my favorite! The exhibits started before we even made our way inside the museum. Most everything on display in the Techstyle exhibit was 3D printed which was so interesting and then we took in some art work from Monet...does anyone else think of the quote from Clueless? Clearly we were wrong about the weather because it turned out to be a gorgeous day with some parts of Boston reminiscent of London! Our good friends got engaged on their vacation a few weeks ago and we were finally able to celebrate on Sunday with brunch! After we said our goodbyes, Gary and I along with the rest of Boston enjoyed the city in bloom! And if you haven't watched the new season of Unbreakable Kimmy Schmidt I highly suggest it...with a side of elan low fat frozen yogurt - that will be the perfect end to any night! How was your weekend? Link up below to share your weekends with us! What a fun weekend! Your passover dinner looks amazing. Brunch is always a good idea, especially when there is something to celebrate! Happy Monday! Those exhibits are gorgeous!! ahhh Spring weather at it's finest, what a picture perfect day you had yesterday, it's days like that, that make Monday much easier! Those tulips are incredible!!! What a great weekend! I am glad that it turned out pretty for you it looks like you enjoyed it to the fullest! Such a fun weekend! Love that y'all were able to enjoy the beautiful weather in the city! And congrats to your friends--an engagement is such a fun season of life! What a fun weekend!! It looked beautiful everywhere you went! Your Passover dinner looked beautiful! I was laughing at your snaps with your boots and umbrellas when the rain cleared up! We were in the same boat when we left the mall that morning. I'm glad it cleared up though so the day could get nicer. All of the pretty flowers and blooms! Yes!! Saw the tulips on your snap and it made me happy! Love when the tulips pop up in Boston..! Just so pretty! Happy Monday! a beautiful boston weekend!! loving all of the flowers--swoon! We do a lot of 3D printing for one of the companies I represent for work and it always blows my mind how real it ends up looking! Hooray for beautiful weather and time spent outside! Looks like such a nice weekend and the weather was beautiful. Love seeing everything in bloom for the Spring! So glad you got to enjoy some of the nice weather despite wearing your wellies and carrying around an umbrella! Sunday was supposed to be rainy here too but turned out to be a beautiful day!! Look at those tulips--it looks so gorgeous there! I TOTALLY think of the Clueless quote when I hear "Monet." That movie is basically the holy grail! Glad you had such a fun, relaxing weekend! This post literally just made me feel like I could take on this week! I am in love with those gorgeous tulips! Happy Monday! What a pretty weekend! We did a bit of museum hopping too and had shockingly good weather! Love the photos! What a fun exhibit you got to see!!! Boston looks so beautiful right now! The weather felt like summer down here and I wasn't complaining. I am only a few episodes in to season 2 of Kimmy but I am loving it. Have a great week! It looks like you guys had such a fun weekend-- it's always the best when the weather cooperates. Your sister's tablescape for Passover is so pretty & loving your pink bag! Monday Mantra = yes. And what a wonderful weekend you had! Congratulations to your friend! The weather was tricky here Saturday too. Rain off and on for most of the day but then bright sun and warmth. It was pretty awesome. Hope you had a wonderful Passover celebration with your family! Looks like a fun and gorgeous weekend in your area!!! Happy Monday! Even though your day started off gloomy, it sounds like you definitely made the best of it, especially when the sun came out! Your Passover dinner looks delicious, and it sounds like you had a blast celebrating with your family! 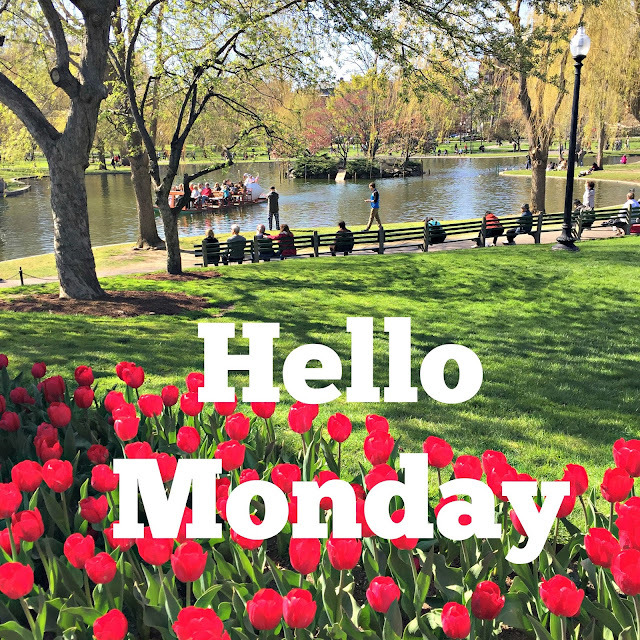 I hope your Monday is off to a great start! It sounds like you had an amazing Passover!! And I love your pictures of the park, so gorgeous! omg boston right now! so so pretty. what fun at the museum. and monet - yes i think of clueless too haha. the passover table spread looks so pretty at your sisters! happy monday girly! You always have such fun weekends! I've been loving following along on Snapchat! Have a great week! What a great weekend! Loved seeing your snaps from the museum...it looked so cool! And congratulations to your friends! So fun you could celebrate with brunch! Looks like such a fun weekend! That red sculpture outside the museum is amazing!! And the park with the tulips, so pretty. Happy Monday! Looks like you all had such a fun weekend!! Aren't those the best?! I can't wait to watch the second season! I love the mini MAB bag! It looks so cute!! Boston in the Spring is the best, enjoy every minute! The passover looks like such fun and such a pretty setup! Loving all these spring flowers in your photos! Sounds like an amazing weekend! That museum looks awesome! So glad the weather cleared up! Glad you had a good Passover too! Exciting!! I love that picture of the area that reminds you of London. Gorgeous!! I saw your pics and videos on snapchat this weekend! Yay for finally using it! I loved that flower artwork that was moving! 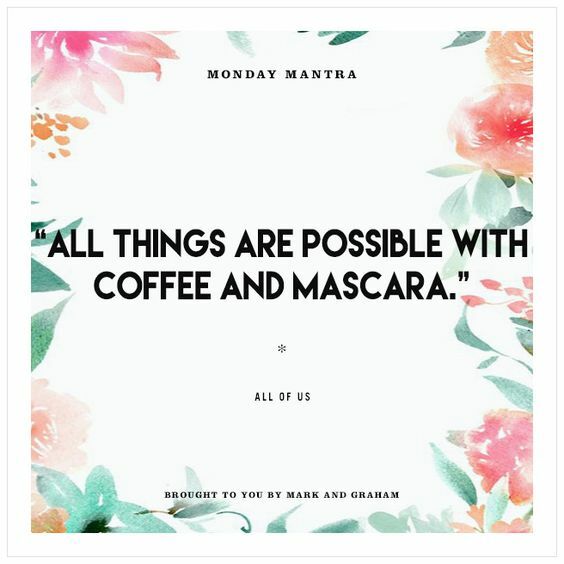 All things are possible with coffee and mascara. Love that! The art exhibit looks amazing, and I am glad you got some good weather to enjoy. Sounds like such a great weekend, Biana! First off, I hope you had a wonderful Passover, the table setting looked amazing and I'm sure the Matzo soup was delicious! The exhibit sounds so interesting! I love the outfit you wore for brunch, the pop of pink in your bag looks lovely against the chambray and white jeans! I'm so glad you enjoyed the beautiful weather we had here on the east coast this weekend, it was such a nice treat! Thanks so much for sharing, gorgeous, and I hope you have the best week ahead! What a beautiful weekend! That art exhibit looks amazing. And, I love that little sign that your engaged friend had at brunch, too cute! Gorgeous and what a fun weekend! I was really glad the weather turned out to be as beautiful as it did. what a fun weekend! you sure did have great weather as well...it's finally starting to feel like spring around canada too. I need the check out the TechStyle exhibit! Such a fun weekend. Your pictures always make me want to go to Boston, that needs to be one of our next trips! I LOVE museums! And Monet is one of my favorite artists... my daddy is a painter so I was raised around art. We even had a cat named Monet. Lol. 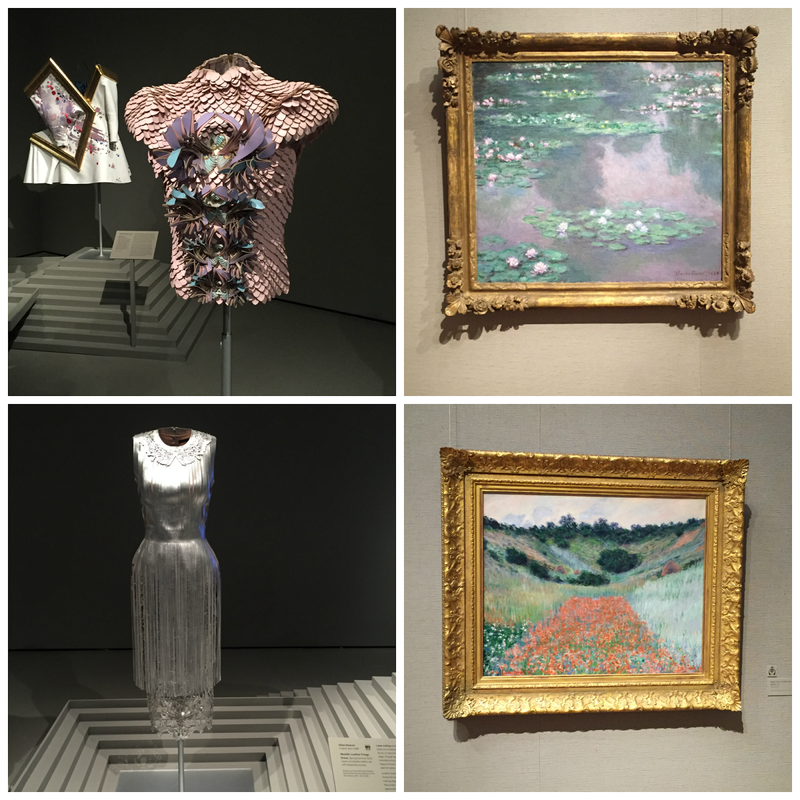 I remember the first time I saw a Monet up close and personal - it was in The High Museum in ATL and I remember just being so completely in awe to be standing there in its presence. So overwhelming! And yes, girl, I totally always think about Clueless when I hear someone say that. I actually described a girl as a Monet the other day and Brian totally didn't get it. He's never seen Clueless!!!! I KNOW!!!! Another great weekend! The exhibited you visited looks awesome! That giant flower is THE coolest! Looks like a fun place to visit! Well now I want to go to the museum! Looks like a fun weekend! What beautiful photos- looks like spring has finally arrived! Sounds like such a fun weekend! I laughed with y'all on Snapchat with your rain boots and umbrella and the sun was suddenly shining! Sounds like Texas weather! Ha!! So happy to hear that Boston is in full bloom! Sounds like a great weekend! "She's like a full on monet" hahah I always think of clueless when I hear that! mmm frozen yoghurt. yum. and um yes i totally think of the monet quote from clueless haha hilarious! those exhibits look super interesting. Wow! Those exhibits are amazing! Looks like an awesome weekend! Isn't it the best when the weather surprises you?! It was supposed to rain here today, but it's been 75 and sunny - perfection! Glad you had a great Passover! i'm sure your passover dinner with family was delicious! Don't you love when the universe surprises you with beautiful weather? Boston looks gorgeous in bloom! Looks like it turned out to be a fabulous weekend! Love all the pretty blooms all over and that exhibit looks so cool! I totally started season 2 of Unbreakable Kimmy Schmidt and love it so far!! Looks like an awesome weekend!! Stunning shots too! What a perfect weekend, Biana! The flowers look gorgeous...well, Boston in general! Glad y'all had good weather! Hope you have a great week ahead! What a beautiful weekend, and such a gorgeous Passover table! I just finished Kimmy Schmidt this morning... it was so good! Hope you have a great week! Sounds like a beautiful weekend, love all the pretty blooms and the museum looks like a great time! Loved your snaps from the museum, looked like a really cool display! That shot of the white building is gorgeous, I am dying to get to Boston! Hope your week is just as wonderful as your weekend was! The weather looks absolutely gorgeous and that exhibit looks really cool - I don't think I've ever seen anything IRL that was 3D printed. Hey girl! Just found you through Megan's blog, Can I decide Another Day. I think I'll start linking up my weekend posts. Your weather was beautiful! Is your husband Jewish as well? Congrats to you friends on their engagement! You weekend looks amazing. I just left Israel right as they were celebrating Passover. So cool.